Have you printed something lately and the bottom half of the letters are all cut off or your images are faded? You've reached that dreaded moment: you need more printer ink. Depending on the printer you own, it can seem like the new ink cartridges cost more than just buying another printer..sometimes this is actually true. BUT, there are a couple ways around paying a high cost for new ink. 1) BEFORE you replace your cartridges, give them a good shake, you'll get a few more good pages out before you replace them. If you think your cartridges may just be dried up, take a wet paper towel and rub it on the bottom of your cartridge until ink starts dribbling out; this will moisten the cartridges. Pop them in and try again. 2) In my town there is a store called Cartridge World. They refill your old ink cartridges for a fraction of the cost instead of giving you new ones and they guarantee their service works. Check to see if there's one near you on their website and start savin' on all your refills! 3) If your current printer cartridges cost a bundle, do consider investing in a different printer. The cost of the new printer will include 2 ink cartridges, so do the math before you make your next purchase. When I picked out my last printer, I researched the ink cartridges prices that matched my printer and made sure they were affordable so that I would save money over time. 4) Do you have old printer cartridges sitting around? 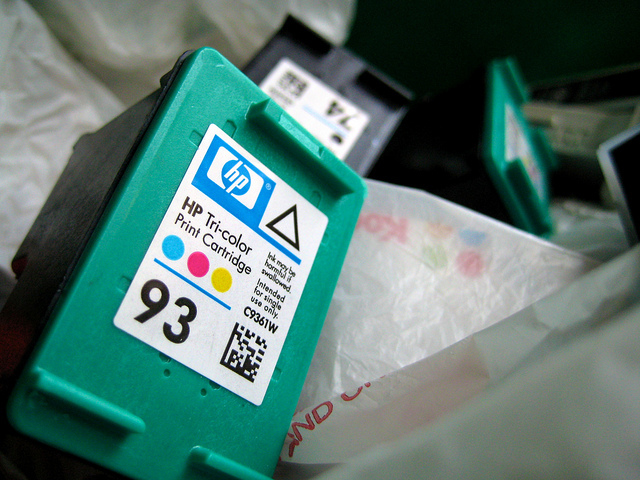 Places like Staples and Office Max actually give you a few dollars credit for every cartridge your recycle. Check out your local office supply store to see what they are offering for your old ink. Have another suggestion? Post it here!